The Waveney Herd of Belties ! 2015 saw the arrival at Carr Farm of our beautiful little herd of belted galloways. Our group of cattle arrived after a long journey from North Yorkshire and were pleased to be let onto our lush Waveney valley grazing marshes. Our Waveney herd of belties was started with stock from the Mochrum herd originally owned by the Marquis of Bute and one of only four belted galloway foundation herds, we have subsequently introduced new bloodlines. The Belted Galloway is thought to have evolved in the seventeenth century; a result of cross-breeding between the native black Galloway cattle of western Scotland and the Dutch Lakenvelde belted cattle. The cattle are well adapted to living on the poor upland pastures and windswept moors of Galloway hills in south west Scotland. By the mid 1800’s the cattle had developed as a polled breed, and by 1878 the Belted Galloway had it’s own herd book. The Belted Galloway Association was set up in 1921 by the four foundation herds including Mochrum. The Belted Galloway is a stocky medium sized cow, one of the most visually distinctive breeds of cattle, with a thick shaggy coat in winter giving them a “teddy bear” appearance. The Beltie is well-equipped to thrive outdoors all year round in any climate, it’s double coat comprises long outer hairs and a softer undercoat which provides good protection in harsh environments. It also means that they don’t grow a thick layer of fat under their skin to keep them warm which makes the meat leaner. The breed are also naturally polled making handling easier and the cows live far longer than other cattle often producing and rearing calves well into their twenties, they are well known for their excellent maternal traits. The cattle are generally placid in nature although cows with newborn calves can be very protective. In 2007 breeding numbers had increased which meant they were removed from the Rare Breed Survival Trusts watch list. Our cattle are fully raised on a grass based diet with winter forage consisting of grass, hay and haylage, they are not fed any concentrates. They overwinter outside but we have the option to bring them into straw bedded barns if required. All of our cattle are registered with the Belted Cattle society and it is our intention to increase and add to the herd size within the coming years. Our first homebred calf was born here at Carr Farm in June 2015. Commercial beef beeds of today are large lean continental cattle which may be reared indoors for a large part of their lives and are fed on cereal based rations with additives. They reach maturity much earlier than the native breeds but in doing so lose the great taste which the slow growing grass fed natives have in abundance. Happy cattle are allowed to socialise within their herd, have space to roam and grow at their natural pace. 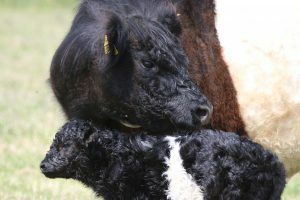 See our welfare page for more information about how we care for our livestock and if you are interested in finding out more about our ‘Beltie Beef’ see our produce pages or visit the shop.